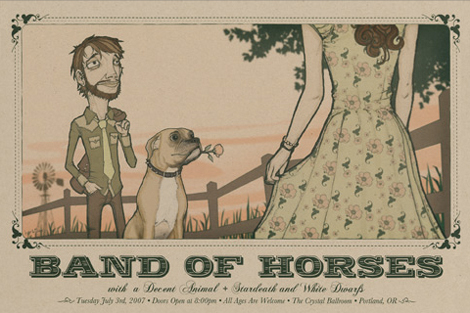 I’d have to strain really hard to figure out which year at Flatstock (SXSW) that I picked up my Band Of Horses print by Boise based illustrator/artist Ben Wilson. Whichever year I picked it up, its always had the most reactions from people walking down my hall of posters. Many of Ben’s prints feature his unique style of drawing people and animals, and from what I can tell, he’s in demand with bigger name touring bands. He’s got some really nice ones in the store, I’m about to buy the new Black Keys print.